It is instructive to consider the differences between Sartre and Camus. The men were friends in the war years. Together, they edited the political journal Combat. But Sartre and Camus fell out on account of their views on Stalin and communism. In the 1950s, Sartre threw his support behind Stalin’s vision of the global communist struggle. Camus was unimpressed by the “ends justify the means” mentality of the communist revolutionaries, and would have no truck with Stalin’s mass production of a perfected humanity. In The Rebel, he made his criticisms plain. Sartre responded in anger and ended their friendship. The break-up was a long time coming. Philosophically, Camus differed with Sartre on key issues including the definition of existential authenticity. Sartre argued that authenticity involves making a fundamental choice about how to live – as a philosopher, writer, communist, whatever. The caveat is that we acknowledge that this is only a choice, and there are other choices we can make in life. Camus argued for what is ultimately, I think, a more uncompromising position: that existential authenticity demands that we admit to ourselves that our plans and projects are for the most part hopeless and in vain – and struggle on regardless. 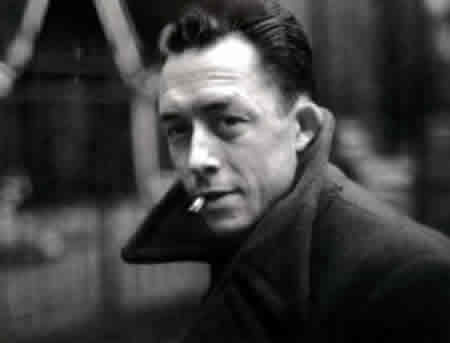 This, for Camus, is existential revolt – to affirm the absurdity of life and continue. ‘Revolt … is a constant confrontation between man and his own obscurity … [It] is certainty of a crushing fate, without the resignation which out to accompany it’. Camus crystallizes the attitude of revolt in the character of Sisyphus, a figure from Greek myth. ‘The gods had condemned Sisyphus to ceaselessly rolling a rock to the top of a mountain, whence the stone would fall back of its own weight. They had thought with some reason that there is no more dreadful punishment than futile and hopeless labor’. Struggle to get out of bed in the morning? Imagine being Sisyphus. Sisyphus is forced each day to roll a boulder to the top of a mountain to watch it roll down again. This is the human condition, Camus says. A backbreaking labour without purpose, payoff, or end. Then you die. Yet Camus affirms Sisyphus as the absurd hero. What makes Sisyphus heroic? Sisyphus endures his fate. But what makes him heroic is not just that he suffers his fate, it is because he is ‘superior’ to it. Sisyphus does not weep and lament his state and condition. Out of scorn for the gods who condemned him to this fate, he affirms his labor, and concludes that all is well. Fixing his eye on the stone at the bottom of the hill, he trudges down the slope to retrieve it. Camus ends: ‘One must imagine that Sisyphus is happy’. ‘It may be thought that suicide follows revolt – but wrongly. … [R]evolt gives value to life. … To a man devoid of blinders, there is no finer sight than that of the intelligence at grips with a reality that transcends it’ (Camus, The Myth of Sisyphus). The first question remains suicide, nae? How are you Tim … glad to see you still have time to blog. I happened to read L’etranger when I was 13. Coincident with Stranger in a Strange Land;. (Did I use the title as a thread to follow? Dunno.) A decade later I had an exhaustive collection of Camus’ writing. In the end, for me, it comes down to what one does in the privacy / solitude / isolation of an unattended moment. And key, to me, is !suicide. Simply choosing to persist. I’ve pressed since September 1973 to dis-confirm the conclusion I reached when pondering the deep social roots of that moment … how we came to over-throw Chile’s democratically elected government. My conclusion stands. That gives me neither pleasure nor comfort. Enron, Katrian, BP/Gulf of Mexico, it’s always the same: people acting as though petty opportunism is the best that they can manage. Looks like it’s going to be game / set / match for the psychopaths. What bothers me most? I can’t play the mutal admiration game my cohort has honed to perfection, which means I’m doomed to carry on as an army of 1. HeyHo, and so it goes. And goes. And goes. Thanks for the thoughts, Ben. The psychopaths may win the battles, and maybe even the war, but history has it’s judgment and cold monsters they remain. I like to think that it’s little people like you and me that give warmth to the world. But, yes, we have to deal with the fact of defeat. I’ve been mulling over Camus attitude of revolt recently because it seems like the most heroic attitude one can take to defeat. Perhaps it even redeems it. I’m not sure. Camus thought so. It’s of course situation that puts philosophy to the test (You’ve read Sartre’s trilogy, I’m sure) so am kind of sad nobody on Camus’ team in the French underground had exposure to buddhadharma as we know it today. I would have like to see how it held up! But this: when I apply diamond-cutter logic to my fuckups I come up with, most often, “I could have done no other”. That my life philosophy held up even under the strain of SEP73 (when my psyche blew a fusable link) says something about structural integrity. And that, I have to suggest, says something about validity. p.s. I sometimes joke that I hunt werewolves. It’s half a joke. As though a sniper behind enemy lines (i.e. I can count on my bourgeois yuppie cohort for no form of support) I am hunting psychopaths. see http://bentrem.sycks.net/fallen_angels.html … circa 1995, 3 years before I went to Dalhousie to study cog-psych/criminology. This is excellent – thanks so much – I’ve struggled for some time to articulate the differences between Sartre and Camus – and you’ve hit the nail on the head (so to speak). I’ve been so intrigued with these differences that (for an assignment in a creative writing program) I’ve been integrating them into a play. Quite possibly (due to time constraints and parameters of the assignment) probably only the first Act of my play will be written. I like to think that both Sartre and Camus would enjoy that however – of course – in their own ways! What about the fact that these people come up with these ideas to justify their own ideas of life. Where is subjectivity left on the topic of existence? I believe we all chose to find a meaning that holds value, rather than being forced to. In a sense, we substitute existential ignorance with a mediocre truth that we objectively accept. Life is simply a flash of brilliance, where it goes after that, who knows? Does it have to go any where? @Me – why the compulsion to disagree? It seems to me what you wrote is consonant with the post. It certainly doesn’t contradict. Does being oppositional give you a sense of existing? How does he feel bout much needed social and economic revolution! Good question. Camus was definitely a leftist progressive, but he believed too much in personal liberty to side with the kind of social engineering that characterised the Russian and Chinese experiments of the time. He was also fond of political theatre – he wrote a number of politically themed avant guard plays. I suspect that, if he hadn’t died in 1960 (car accident), he would’ve become interested in the Situationism of Guy Debord, which would have aligned him with the student radicals of 68. Then again, given his distrust of parties and institutions, he might have wound up embracing neoliberalism! Somehow, though, I doubt it. He was too much an outsider for any political program. Activist against Nazism- hoe does this square w/ his non-ideological stance? The Sartre vs Camus issue came up recently in something i read. I’ll see if I can find a link. Yes, Sartre was an ideologue from 50s on. Communism was his existential decision. Camus was not indifferent to the Algerian struggle, contributed to NGOs, campaign’s, etc. He refused to frame it as a contribution to a revolutionary struggle. More like eternal insurrection. Way better suits a life of Activism? Yes. We’d have to have a talk about activism, but Sartre was more the revolutionary. Putting my bias right up from, I side with Camus on most things. In terms of political activism, I think it’s easy to paint Sartre as more radical/active. I think he was just more willing to sacrifice. Connecting some dots, I think Camus was more averse to human suffering. E.g. He famously said (and took a lot of flak for saying) despite support the rebels in Algeria, his mom rides trains there and he would prefer if the rebels didn’t throw bombs on those trains (not even close to verbatim- it was at his Nobel prize press conference). Being the social engineering aspect of Stalinism, he also rejected Sartre’s you have to break a few eggs to make an omelet with re: to gulags/political murders/etc. If you read the rebel, it would be harder to find a stronger advocate for social change that reduced human suffering. And I think the logic he uses is less compromising (stole from poster- great way to put it) than that of Sartre. Of success – all based on solidarity, rather than personal liberty! Aronson suggests also that Sartre the Revolutionary – Camus, the Quietist. Cripple human Freedom, thus need for active opposition to tyranny, corruption. Hi I’m in year 12 and am doing a theatre studies assignment about Absurdism. I’m still struggling to fully grasp the differences between the two. Could someone please just write few sentences stating their main differences in idealogies?? It would be much appreciated thank you! Hi Polly. I’m a bit confused by your question. What is the other ideology in addition to Absurdism? Existentialism? If you want to be / become / remain a donkey, fish for easy answers to hard questions. If you want to develop your mind, I suggest you find a couple of key books on “Theatre of the Absurd”. Alternative: read dear Camus’ short stories. The correct reward for laziness is sudden death. Failing that, laziness leads to corruption. 2+2 … some folk say the sum is relative. Go figure. Reblogged this on Rikki Tiki Tavi Mongoose is Gone. But who can be absolutely sure that there is death after suicide? What if the suicide is the shortcut to meeting God? Saying that suicide leads to no afterlife is just as uncertain as saying that tomorrow will be a better day, isn’t it? True, we can’t be *absolutely* sure that suicide leads to death, though observation shows this is the case 100% of the time. Perhaps you are right and it’s the fast track to heaven. Or the fast track to hell, or Mars, or anywhere or anything. When we move in areas in which nothing is certain, anything is possible. My advice is: don’t do it. 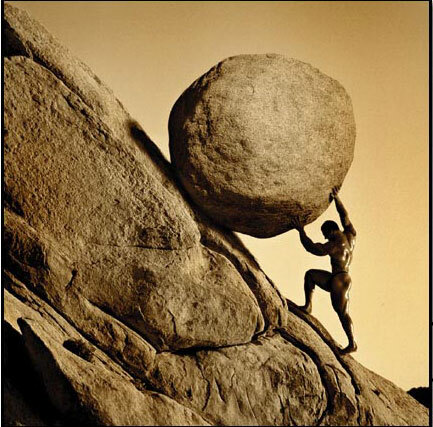 As a lifelong diehard fan of the Chicago Cubs, I’m perfectly position to understand the frustration of Sisyphus. Every year the rock is pushed up the hill, and like clockwork every year it falls back down. It’s worth noting that Sisyphus couldn’t commit suicide or rely on illusion of an after life because he condemned to eternal futile labor. He had no choice but to accept his fate. We human can choose to commit suicide. If there’s no go or afterlife, death is simply a painless non existence. From that point of view, death is not the problem, life is. We are all condemned to life. Suicide is end of all suffering. After reading ‘The Myth of Sisyphus’ and gaining some background knowledge on Existentialism and Absurdity, the idea of the revolt makes sense. Those who are superior to their fate — much like Sisyphus — are the ones winning the ‘battle’ rather than those who implement the torture. If this was applied to the real world and work life the work force would be very productive. The employers would attempt to be superior to their ‘fate’ and bosses, thus, working in their environment without complaint. Speaking as someone who has practised existentialist revolt in the context of some pretty menial jobs, I can confirm: it works! Ironically, however, it can lead to acquiescence, as opposed to proactive workplace change. This, I think, is a problem with Camus’ idea of existential revolt: it potentially undermines the spirit of real revolt. On the other hand (as I also discovered), it enables one to maintain one’s fighting spirit, potentially to direct one’s energies into creative pursuits outside of work. Still, this does not resolve the problem within the workplace. It is the human condition to try to understand what we do not. To search for an answer to why, we as humans are here. I think there is a sense of poetry and beauty behind Camus outlook on existence. I feel as though to some it can be seen as bleak. To me, the idea that there is no meaning to this world, no ultimate question to strive to answer is a huge burden taken off the shoulders of humanity. The absurd gives people to ability to break away from a society that with all its might tries to control. Everything that is said and discovered connects to the idea that it will bring one closer to understanding and control over the world we live. What really resonated with me was Camus comment and the authors interpretation “that existential authenticity demands that we admit to ourselves that our plans and projects are for the most part hopeless and in vain – and struggle on regardless.” I hold this to be very true in the scheme of why humanity has religion, science, philosophy, and morality. All of these subjects can be used as a guiding forces to give life meaning and understanding over the world. With this, it is in vain because in the eyes of Camus there is no meaning. It could be that we have created meaning because a fundamental need to feel as though we have achieved something, a sense of being, love, but I feel most importantly happiness. People do everything they can to attempt to achieve their own happiness or help others achieve happiness. The unknown is scary because happiness is not guaranteed but by having subjects such a religion, moral codes, science, and philosophy it makes it easier because it supplies hope. These subjects give people purpose and the ability to take out the unknown because with them it is known that day after day nothing will change in the holy books of religion, what is asked for by them, what is considered morally right and wrong, what is held by science to be true. People are happy with knowing what will happen day after day, without the confusion of not knowing anything. We accept the fate that we assign ourselves. Just as Sisyphus accepted the fate he knew to be true. We can assume Sisyphus is happy because he knows his fate. He does not have to deal with the “angst” others have to. There is no pressure for him to build a life and create himself, when all he has to do is roll a rock up a hill everyday. He will endure no change. I agree with your statement that explains his thinking as “Human beings are caught in a constant attempt to derive meaning from a meaningless world.” In his novel The Stranger, this idea is shown especially in the courtroom scenes. Everyone needs to know why he killed the Arab, inferring mental disorders and other theories- when really he could have done it just to do it. Humans need to know why. They need a purpose in life that gives them something to believe in. Having faith means that you have a concrete reason as to why you’re on earth and what everyone’s purpose and meaning is. If you have faith, you know that there is evil in the world and that it’s not God’s intention to have all of this suffering. If you aren’t religious or believe in God, you will always be asking what they truth is and what is the meaning of life. Expecting people to acknowledge the “truth” that is there is no meaning to life and to not let if affect them, is just very unrealistic. However, Sisyphus was happy because he knew that there would be no change happening with his life, he knows his fate. If people who aren’t religious can simply accept what life and the universe dishes out to them, then instead of the route of suicide, they can just live their lives. Thanks you and looking forward for your wasted time, or how ever you interpred it xD. The idea of ‘revolt’ can be misleading, since it’s usually applied in a political context. In the case of Camus’ existential revolt, one is revolting not against the political order, but against the absurdity of existence itself. It is wrong to assume that this absurdity goes away when we stop thinking about it. Our lives are absurd, Camus suggests, because we struggle for meaning, status, and achievement, yet all these things amount to nothing in the fullness of time. But we are fated to continue, like Sisyphus rolling his rock up the hill. That’s absurdity – it’s part of the human condition. The idea of revolt is informed by Nietzsche’s view of life-affirmation. Nietzsche had a tragic view of life. It’s all kinds of bad, he reflected, yet the healthiest, most heroic humans are able to face this fact and embrace life nonetheless. Camus’ view is similar. We need to be able to squarely face the absurdity of life and say ‘yes’ to it. This is what it means to be greater than your fate. If you can achieve this state of mind, you are capable of incredible things. You are capable, at least, of facing the worst that life can throw at you and continuing to smile, which is a heroic act in itself. Such a good explanation from you. Thank you for your unbelievably fast answer, which i did not expect at all that fast ! I am really confused. Sisyphuss revolt was logical because it was against gods. Men rebellion is against absurd, but absurd don’t care whether we live in rebellion, go for hope, or commit suicide. What is your opinion on that? Sisyphus isn’t revolting against the gods. He’s revolting against the miserable conditions to which the gods have condemned him. Certainly, these conditions don’t ‘care’ about what he does – a state of affairs does not have an opinion. But Sisyphus is not motivated by opposition and rejection. His style of revolt is positive and life-affirming. He chooses to revolt for personal reasons: to rise above his circumstances and find happiness in them. He embodies and Stoic insight: human beings can be happy under any circumstances, assuming they have the right mindset.